About 3 hours north of Toronto way up in Central Ontario is one of our favorite places in the Province. Haliburton Forest is a nature lovers dream. A place for hiking, mountain biking and canoeing in the summer and cross country skiing, ice fishing and dog sledding in the winter. 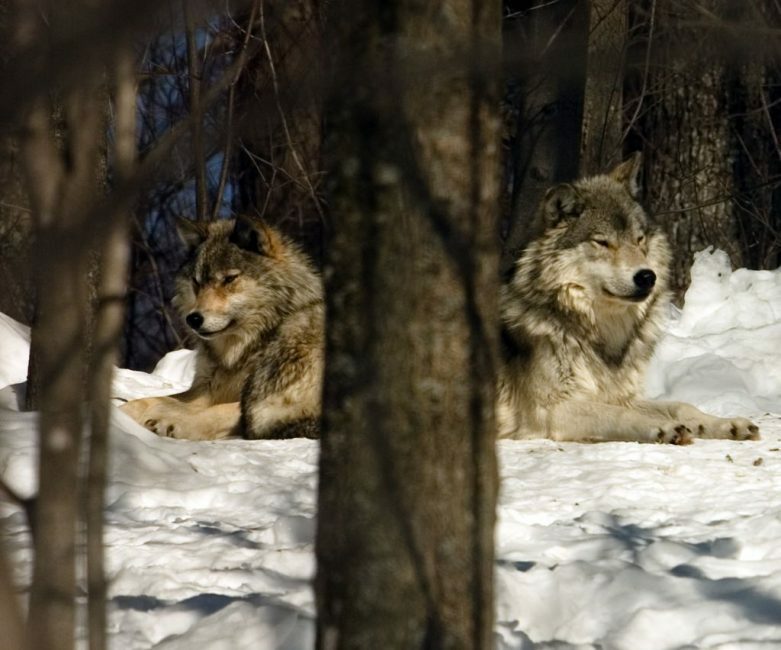 But it is the Haliburton Forest Wild Life and Reserve which houses the Grey Wolf Sanctuary that has kept us coming back. Witness and learn about the pack of Wolves that live and roam freely on a 15 acre reserve set aside for them. This Grey Wolf Sanctuary sits within 70,000 acres of protected hardwood forest at The Haliburton Forest and Wildlife Reserve. There are a couple of wild packs and lone grey wolves that roam the forest as well, but you will have a better chance of spotting these beautiful canines in their natural habitat at the viewing area for the pack of protected Grey Wolves. 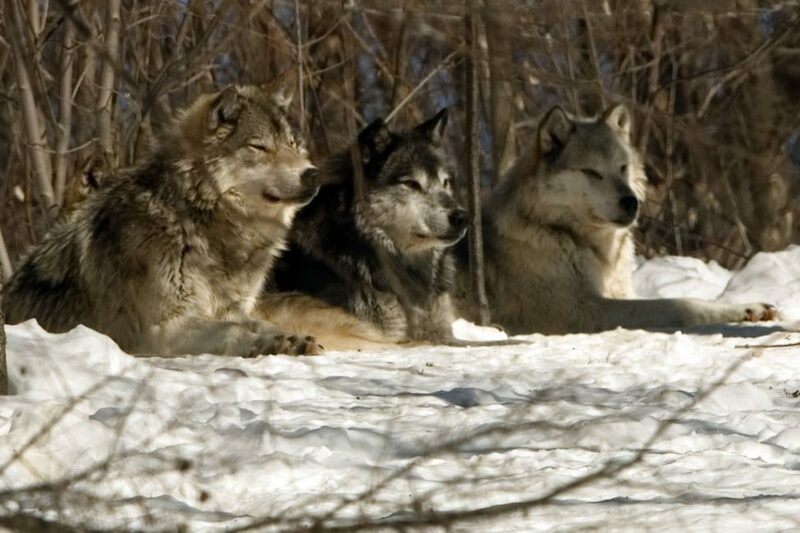 It is a long story as to why these wolves are protected dating back to 1977 in Pennsylvania. You can read about their story at the website HaliburtonForest.com and find out how the wolves came to Ontario in 1992 living on through new litters and pups. We have visited the Grey Wolf Sanctuary twice. Once in Winter and Once in the Fall. We were lucky to be able to see them both times. Viewings are not guaranteed as the wolves are free to roam wherever they choose. Their daily lives are disrupted as little as possible making it a reserve that I support wholeheartedly. 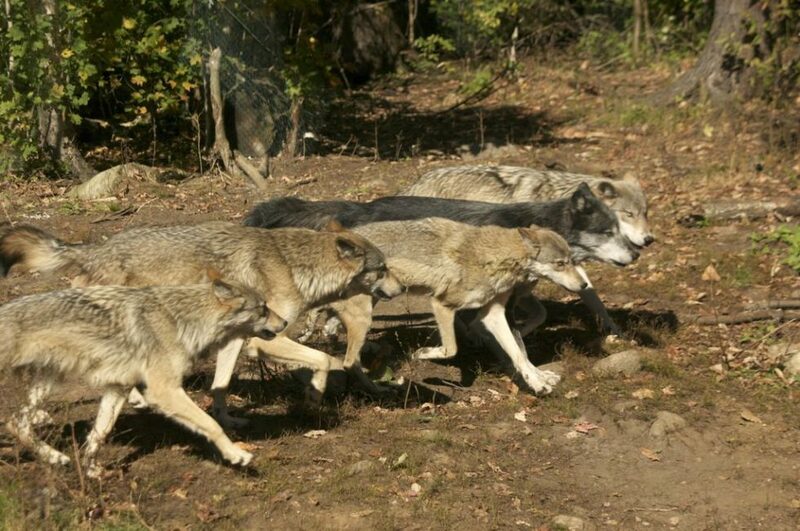 Tourists can only view the wolves from inside a glass enclosure overlooking the feeding area. 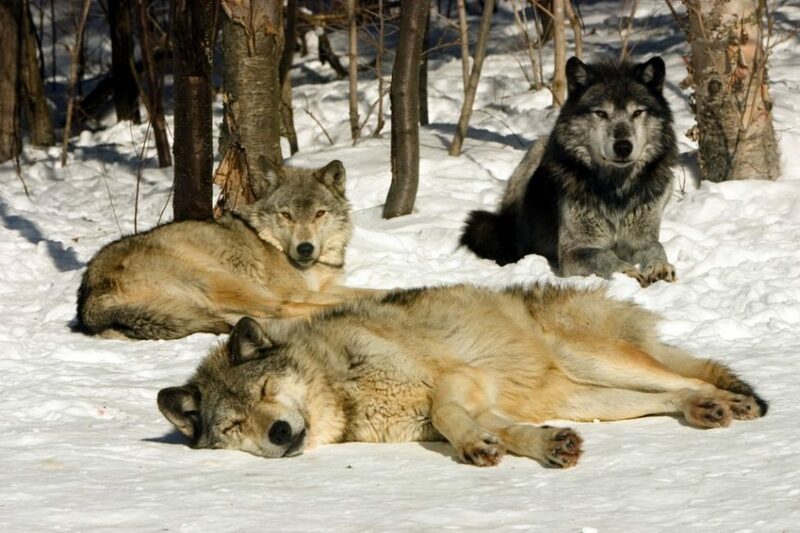 You are asked to remain quiet as you observe the wolves go on with their day. If you time it right, you may be treated to watching them feed. Normally they are fed beavers, but we happened to be there on a day when they were fed a deer. Two workers brought out a deer killed by traffic for the pack to feast upon. Grey Wolves may look cute and sweet, but to see them eat as a pack reminds us all how wild they are. All animals are dead already for feedings, we were told mostly by roadkill or by local trappers. 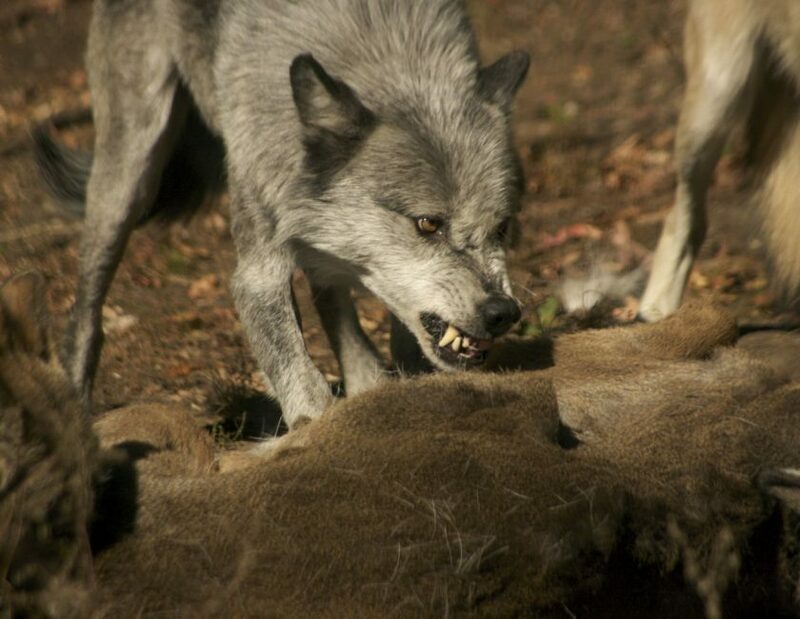 They wolves are still very vicious when they eat and it is a fight to try and steal a morsel from the Alpha male. We learned a great deal about the hierarchy of the pack. The Alpha Male runs the clan along with his chosen Alpha female. They are followed by the Beta male which is second in command and then the rest fill out the list until the poor Omega wolf. It is difficult as a human to watch the Omega. It is the weakest of the pack and it is severely bullied by the other wolves. It is the last to eat and it stays to itself while the rest of the pack sleeps and plays together. The sanctuary does not intervene as this is the way of the wolf and it is not for we humans to decide how they should live. Eventually, the Omega will be killed by the pack or it will go off by itself to die or as we were told, sometimes they become so sick that they need to be euthanized by staff veterinarians.. So sad, our heart breaks and we just want to save it. But to take the omega away will only make room for another Omega to be chosen, so there is nothing that we can do. 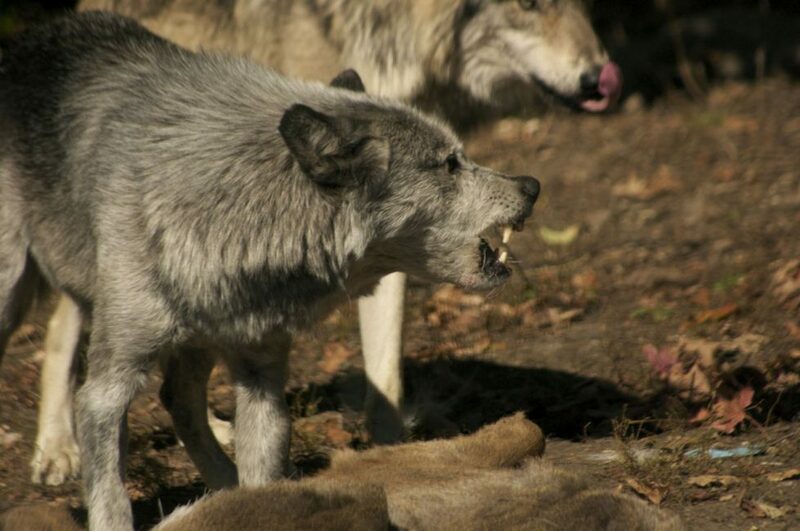 These grey wolves are left to themselves other than at feedings. Eventually, one of the younger Beta Males and Females will overtake the Alpha's and the cycle will continue. Another great thing that the Wolf Sanctuary is working on is dispelling the myths of the Big Bad Wolf. It is a fact that wolves are more afraid of humans that we are of them. Wolves have had a very bad rap in history and they have been ruthlessly slaughtered by humans. Their numbers are slowly coming back, but people seem to be no less afraid of them. At the centre, they informed us that their is no evidence of a healthy wolf ever killing a human and wolf attacks in are very rare. Often when there is a wolf attack it is a rabid wolf or wolf/dog hybrids. 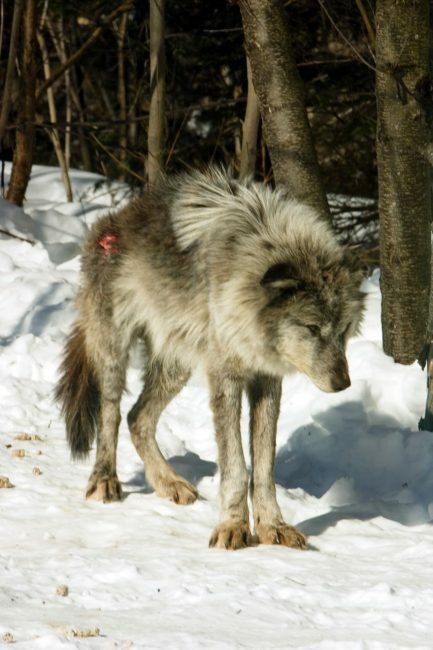 Wolves are more likely to flee when humans approach. My rule has always been, when you are in the wilderness, you are in the environment of wildlife. You are in their homes. You have to take responsibility for yourself and take the proper precautions. I don't understand why the human race feels entitled to every piece of land on earth and if an animal attacks while defending their territory or their young, we get our noses out of joint. We encroach on their environment and leave them with less and less habitat, but heaven forbid if they wander into our streets which used to be their stomping grounds. O.K., enough of yet another one of my rants. 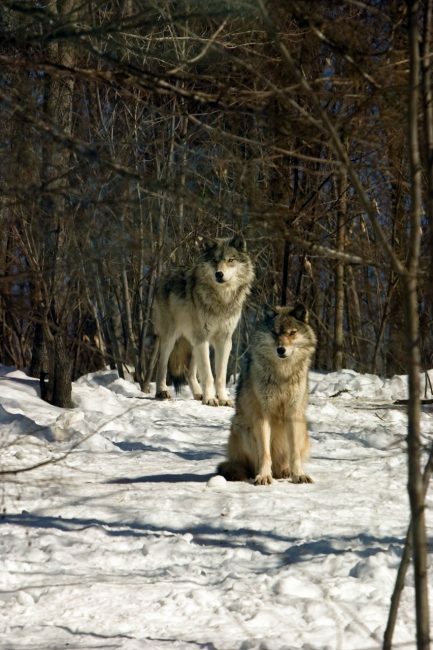 Wintertime is also a great time to visit the grey wolves. The location of the viewing area is perfect as the sun beats down on a slope that the wolves love to bask in. It is easier to see them too as the leaves on the trees don't obstruct your view. It is only $9.00 to visit the Grey Wolf Sanctuary. It is worth it to take a day or two and stay up in Central Ontario. 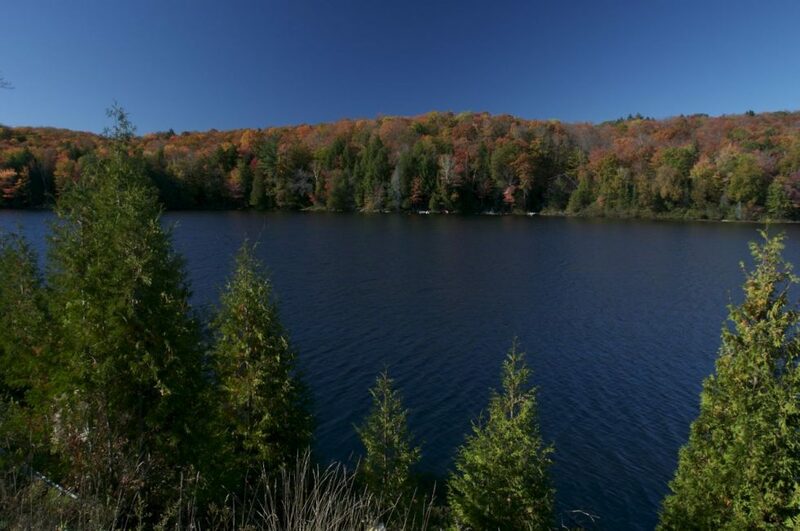 It is a beautiful location consisting of 60 lakes and thousands of acres of forest. It is a wild country where moose and bears roam freely and you will see otters, deer, porcupine, grouse and great blue herons and many more. Stay in rustic cabins, pitch a tent or find a nearby resort. You can find something for everyone in Ontario. 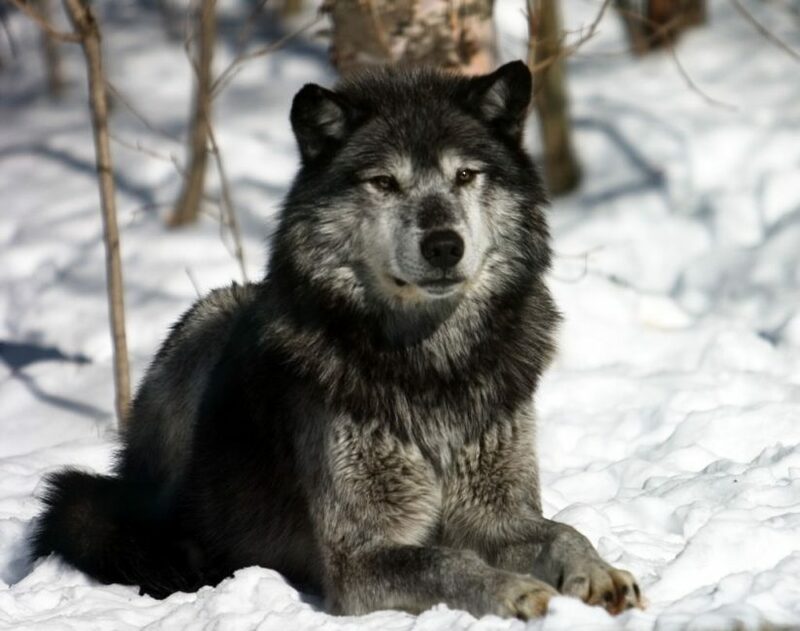 21 Responses to "The Grey Wolf Sanctuary of Haliburton Forest"
I love wolves, they are so cool, and awesome! Thank you for another wonderful article. The place else could anyone get that kind of information in such an ideal approach of writing? I have a presentation next week, and I am on the look for such info. I have a question for you: if qualitative food to assist people increase intelligence, why then, dogs that eat the same food as people for thousands of years, are nothing intelligent than their cousins wolves. 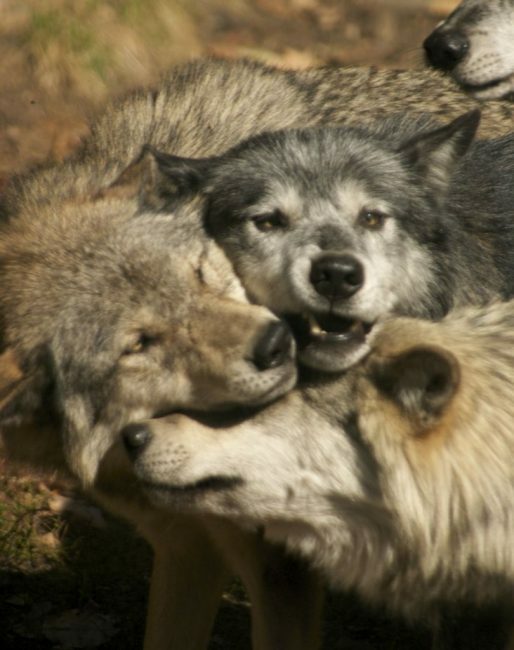 Wolves are more cunning and resourceful, even from domestic dogs. .-= Baric´s last blog ..Russia-Iran Re-population project =-. those wolves look like lions in the 3rd picture. .-= dog insurance´s last blog ..Training classes for dog insurance customers =-. Great pictures guys! I’m heading on another big journey come October. I’ll be backpacking from Saskatchewan all the way to the East Coast. I’ll be sure to make a stop and try and visit the wolf sanctuary. Looks beautiful. Hopefully ol’ Omega will still be there, if I see him I’ll be sure to snap a pic. Beautiful creatures, really is a shame that we humans have a habit of leaving a trail of destruction wherever we go. However, it does seem that in the last 3 years that eco-friendly has become the new black. Now that all the big businesses and mega-corporations are seeing it as another source of income for them, they’re investing all this money into making it finally acceptable to care about the planet, and it’s inhabitants. Western Culture can be so twisted sometimes. I can’t complain though, so long as things continue to be done to make the world a better place it shouldn’t really matter who capitalizes off the situation. Yes, the Alpha Male was certainly proud and strong. He was constantly keeping an eye on the pack. Very proud looking animals. I like the alpha male pose. Yes, we feel sorry for the Omega too. It really takes a beating from the other wolves. I couldn’t take my eyes off of him the whole time we were there. So sad. But at least we will all remember him now. Arent they beautiful? These pictures are lovely. I feel so sorry for the Omega wolf, this one looks injured obviously from the bullying. Love the post. Thanks for the information. We are going to India next year, so we will be sure to check out the National Park. It is true, the growing population is taking its toll everywhere. Thanks for sharing. Gorgeous pics. We love natural refuges for animals and this one looks beautiful. One of our favorites is Ranthambore National Park in India which is one of the few remaining habitats for Bengal tigers. The number of tigers in the park is dwindling not because of poaching or hunting, but because of grazing. Nearby farmers bring their cows to graze on the national park lands, leaving less food for the nilgai (a type of deer), which is the tigers’ natural prey, resulting in less food for the tiger. It’s a different type of exploitation than that which you describe here, but just as harmful.